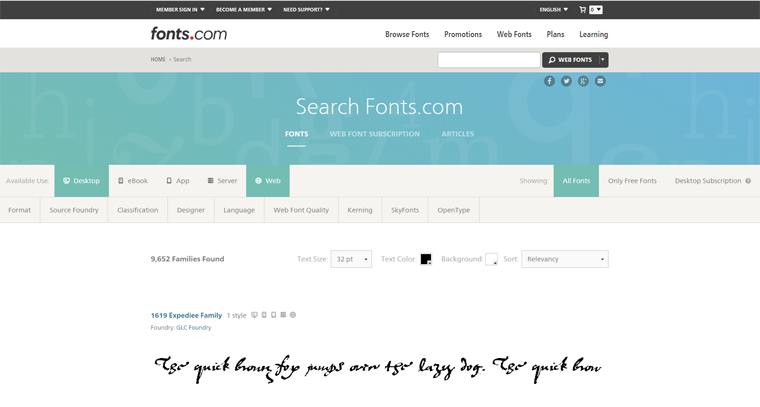 For your convenience there are search fields ready for you to use on virtually every page of Fonts.com. Know the typeface you’re looking for? You can search by typeface name, or even more broadly by style or theme. For example, searching for "handwriting" or "Art Deco" would bring up results that have been tagged with those attributes. In order to narrow down your search results to fonts available for use as Web fonts, look for the "Web Fonts" tab at the top of the search results. What if I don't know the specific font I want? Basic Inventory — Shows fonts that can be used with the Free and Basic Web Fonts Subscriptions. Note that this option is only available on the "Web" Usage section. Desktop Subscription — Fonts that you can use as Mockup or Desktop Fonts with your qualifying subscription. OpenType Support: Many fonts include companion letterforms, such as ligatures, fractions, old style figures, alternate and swash characters. Use this option to find fonts with extra typographic capabilities. Kerning Support: Some of our available Web fonts possess advanced capabilities affording precise control over the spacing between characters. Need to really fine tune how your design displays on your site? Use this option to find the fonts that will give you the ultimate typographic control. SkyFonts Availability: This filter is just what you need to find fonts that are available to use with your plan’s mockup and desktop benefits. Web Font Quality: You can choose from our Screen Optimized fonts, which are selections that have been processed with a set of proprietary tools for optimal rendering, and provide slimmer file sizes. You can also view our hand-tuned fonts: these premium selections are painstakingly enhanced manually by font experts to look their absolute best on screen, even at small sizes. We should note that you can mix and match as many or few filter options with your search term as need be to help you find just what you’re looking for. Or, if you want to see the full list of fonts matching the filter attributes you’ve selected, just leave the main search field blank to return all results. If you'd prefer a more visual way to search for fonts, you can click "Browse Fonts" from the main navigation of the Fonts.com homepage to view fonts using some familiar methods, such as as keyword, foundry, and designer. These categories will provide you a list of related desktop and Web fonts, so to narrow selections down to those you can use on the Web make sure you've selected the "Web Fonts" tab. There's also the option to view new Web fonts, which is a great tool to keep tabs on all the latest designs. Check back frequently! When you do find the font you'd like to work with, selecting it from a results page will take you to that typeface’s family page: an overview showing all the weights and styles of that particular design. If you drill a little deeper, clicking on a particular weight of the collection will bring you to that style’s specific product page. On the top righthand portion of an individual product page you’ll see tabs for “Buy Font” and “Web Font.” Let’s head on over the the “Web Font” tab, where you'll be provided with options to get a feel for the typeface. By default you'll see the typeface specimen for your selection displayed. The other tabs above the specimen will let you get a more detailed overview of the typeface. The "Try It" tab will allow you to set text in real time with the typeface, and the "Waterfall" tab allows you to see your sample text displayed in a multitude of common sizes for easy comparison. The "Character Map" tab lets you explore the individual characters and letterforms included with the font you're previewing, and the "Web Font Browser / OS Samples" tab allows you to see how that font will render in different browsers or operating systems. Hopefully searching for fonts seems less daunting now; adding them to your project is equally pain free. If you'd like to add an entire font family to your project, you can do this right from the search results, just look for the Web fonts option. If you’re signed into your account, when you click the “Web Font” tab in the upper right of a product page you’ll see a couple of menus. The first will be for Web font options; this drop down menu will let you select a project to add your font to, as well as the specific character set for your font (and its associated file size). Generally speaking, the more complex a character set, the larger its file size will be. In addition to the Web Fonts drop down menu, you’ll also see a SkyFonts application button below as well. Clicking will provide options for you to initiate a 5-minute trial of the font, or sync mockup and/or desktop versions of the fonts to your machine if your plan includes those benefits.